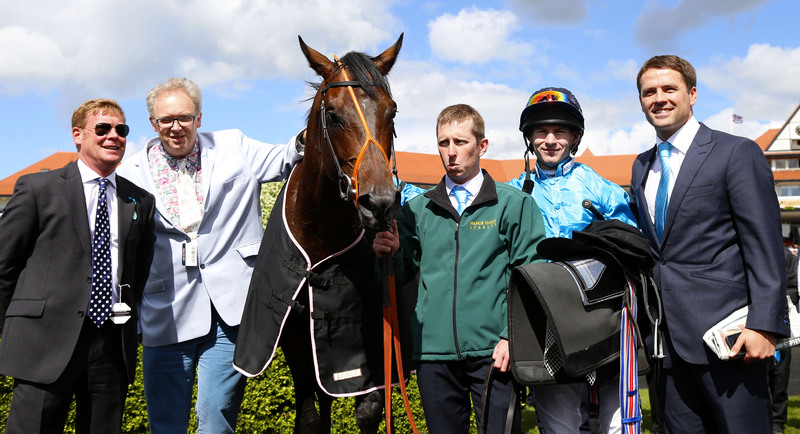 Brown Panther and Richard Kingscote after winning The Boodles Diamond Ormonde Stakes with (left to right) Trainer Tom Dascombe, Andrew Black, stablehand, jockey Richard Kingscote and Michael Owen. Pic: Dan Abraham – racingfotos.com (Courtesy of Great British Racing). Michael Owen has thanked well-wishers for their messages of condolence following the death of his Group 1 winner Brown Panther who was fatally injured in the Irish St Leger on Sunday. The former England International striker bred and owned Brown Panther who was attempting to win the Irish St Leger for the second time when he was pulled up midway through the Group 1 contest by jockey Richard Kingscote. The seven-year-old Brown Panther, the winner of 11 races and £1.1million in prize money, was found to have injured a hind leg and could not be saved. “Genuinely speechless at the kind messages on here today. Thank You,” Owen tweeted late on Sunday night. Owen’s message followed his earlier post paying tribute to Brown Panther whose victories also included the Dubai World Cup in Meydan and the King George V Stakes at Royal Ascot. “It’s the saddest day of my life,” Owen tweeted. “The toughest, most honest, most brilliant horse I will ever set eyes on passed away today doing the thing he loved most. A shattered hind leg, that was irreparable according to the first class team at the Curragh, ended his life. “I was with him when he was born, shared an experience for seven years that will never be repeated and gave him his last kiss goodbye. What an honour to own and breed him. The Irish St Leger was won by Order Of St George. The victory completed a double for trainer Aidan O’Brien who on Saturday won the Ladbrokes St Leger at Doncaster with Bondi Beach who was awarded the race after suffering interference from first-past-the-post Simple Verse.